Before I got pregnant last year (or maybe even longer, eek! ), I promised a friend of mine that I’d made her a bag. 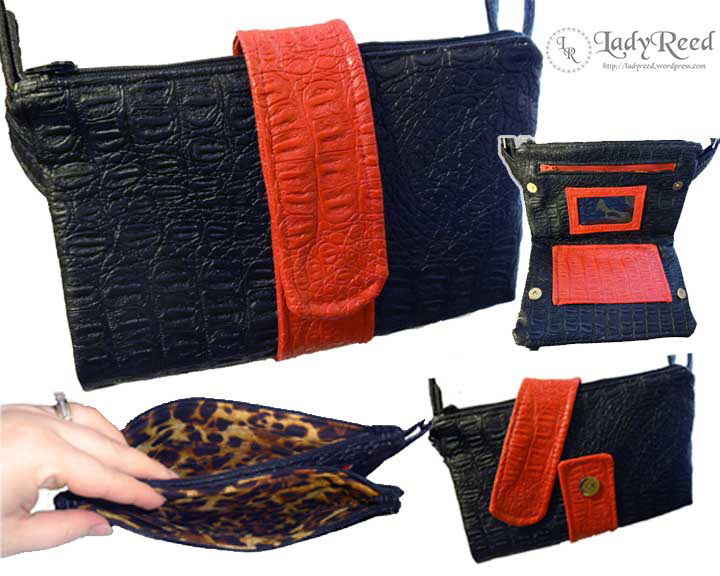 She wanted black and red alligator (faux) skin for the outside and leopard print for the inside. This isn’t something I’d pick to make for myself, but that’s why it’s fun to sew for other people, sometimes. This purse was a bit challenging, but I think it turned out fantastic. One thing I learned during this process is that none of the stores around me sell turn locks or metal sliders anymore. 😦 I guess my purse hardware will have to come from online now. I try to support local stores, especially smaller specialty shops, but I guess this is one chase where online is the only real option. Anybody have favorite places to buy? A Stillness of Chimes by Meg Moseley opens with the main character returning to her hometown due to her mother’s death. Rumors have been circulating around town that Laura’s father, presumed to have drowned years before, has been seen. Laura joins forces with an old flame to find out if there is any truth in the rumors. Along that way, Laura learns more about her past and defines her future. I had the opportunity to review this book before, but passed it up due to what I thought was an implausible story line. However, second time around, I thought I’d give it a shot and I’m so glad that I did. This was a very well written and interesting book that I recommend as a fun read. Some aspects of the story are predicable, like getting back together with her old flame, but it was pleasantly so. In addition, the twists of the story kept the overall book from feeling predicable. Because there were so many twists and new developments in the story, I greatly appreciated the use of foreshadowing. Not once did I feel that any of the new developments were trumped up. Instead, the story was a clear unraveling of the past events and the impact on the character’s current lives. I received a copy of this book from Blogging for Books in exchange for my honest review. All opinions are my own.